Yet another very well painted rendition Don. With all this output I feel a bit of kudos coming on. I have enjoyed looking at all your new aircraft. Here is my Voisin Don. I had to add the extra cross struts because it was too flimsey for game play. Very smart it looks too Alex. Rather puts mine in the shade. Here's mine with more bang for your buck, the cannon mounted version scratch built. Looks O.K. Linz, but I see what you mean about the lighting. 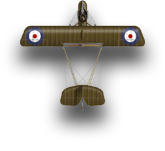 Been working a couple of Voisin IIIs from Reduced Aircraft Factory on Shapeways. All of the colors here are custom-mixed; the decals came from Kevin of Miscminis. I'll give him a big shout-out for working with me on these; I did have to kludge the fuselage serial number on 8501, but otherwise, they came out exactly the way I was hoping. Last edited by zenlizard; 02-12-2019 at 04:16. A fine looking pair of Voisins Sam. Looking good, Sam. I have Voisins on my ‘to get list’. Looks like we will see yours in action soon. Great Voisins Sam. Looking forward to seeing them in action. Last edited by tikkifriend; 02-12-2019 at 12:32. A nice pair of Visions I like that you've done them a slightly different colour. It's obviously not a popular plane so well done for selecting them. I don't know what you do about hand painting a straight line. It has to be about the hardest thing to do. I agree about tape, it doesn't work for me either, although I found it gives a good guide edge to paint up to. I don't know if you thought about varnishing the finished plane but it does tend to disguise the decal edges and make them blend in. Hopefully see these flying OTT. Very nicely done every one. nice. now heres a mini i wish ares would produce. Here are some Russian Voisin III. They are Shapeway planes, Miscmini decals, and Aerodrome bases. It's hard to go wrong using these great ingredients. Now that does call for the rep gun for sheer numbers. Never knowingly under gunned ! Official A.E.G. G.IV Painting thread. All times are GMT -7. The time now is 22:22.